Consumers were more willing in recent months to treat themselves to things they did not need, like baubles and little black dresses. But only if those indulgences could be had for recession-friendly prices. That was underscored on Wednesday when two of the nation’s best-known clothing and accessories purveyors, Saks and the TJX Companies, reported their quarterly earnings. Saks, the upscale department store, posted a loss of $4.6 million, or 3 cents a share, for the three months ended Jan. 30, compared with a loss of $99.7 million, or 72 cents a share, a year earlier. Sales at stores open at least a year, a measure of retail health, declined 4.8 percent compared with the period a year ago. Were it not for several one-time costs that hurt the results, Saks would have had earnings of 6 cents a share. The luxury retailer narrowed its losses by cutting costs, lowering its inventory and striving to appeal to frugal-minded customers. In 2010 it will offer more entry-level prices on designer brands, as well as more exclusive and private label merchandise. Today about 10 percent of the chain’s merchandise is exclusive; the plan is to increase that to about 20 percent. For instance, dresses that can be worn to work and then out on the town are selling well at Saks because consumers are aiming to get more bang for their buck. Mr. Sadove described the luxury sector as much more stable and predictable than last year. “The consumer’s starting to be a bit more comfortable,” he said. Discount chains have been performing far better than upscale stores throughout the economic downturn, and on Wednesday, TJX, which owns chains including TJ Maxx and Marshalls, posted a profit of $395 million, or 94 cents a share, for the period ended Jan 30, compared with $251 million, or 58 cents a share, last year. Sales rose 10 percent, to $5.9 billion. Sales at stores open at least a year climbed 12 percent. TJX has thrived in recent months as consumers thumbed through its racks for brand names at low prices. While the luxury sector has not been as lucky, there were signs of improvement. Saks said in its most recent reporting period that it experienced relative strength in its women’s designer sportswear, handbags, shoes and jewelry categories, as well as its OFF 5th outlet business. Also, its Internet business thrived, posting a 23 percent sales increase. Another positive sign for retailers is that consumers bought more items at full price. Mr. Sadove said shoppers began to realize that inventories were so low that waiting for an item to go on sale might mean being left empty-handed. Saks plans to continue weaning shoppers off discounts with tactics like excluding some products from certain promotions. Some good news also came from Saks’s New York City flagship, which outperformed the rest of the chain’s store base after being hit hard last year by the recession. Mr. Sadove, who described the economic recovery as more of an L-shape than a V-shape, said the tenor of the city felt better. He said he had noticed a pickup in tourism, more confidence from people with jobs on Wall Street and increased activity at the city’s restaurants. The same is true of the luxury sector. But on Wednesday Wall Street was satisfied enough to send shares of Saks up 2 cents, to $7.10 a share. Shares of TJX, which is based in Framingham, Mass., rose $1.33, or 3 percent, to $40.51 a share. COMMENTARY: TJ Maxx and Marshall's have found their niche in the marketplace and have truly benefited from the recession as discounting has become commonplace among fashion retailers. $5.9 billion in revenues is nothing to sneeze at. Vogue readers with iPhones are getting another toy to play with this month. The magazine is launching an application that looks like a fun shopping and styling tool but is actually a savvy way to connect the magazine and its advertisers directly with readers' wallets. It's part of the all-out rush in the fashion industry to embrace technology—most notably with blogging and tweeting—and to make it possible to shop and gaze at fashion not only in stores and from home computers but also while commuting on trains and buses. Numerous designers are live-streaming their Fall 2010 runway shows this month from New York and Europe. Norma Kamali is allowing customers to shop and view her designs on iPhones and Blackberries (she even designs on her iPhone), and Dolce & Gabbana is making their shows in Milan this week available on iPhones. Vogue's entry is called "Vogue Stylist"—and it marks yet another blow to Blackberry users. The application, available only on the iPhone for now, allows users to click on an electronic Vogue ad (or even use the smartphone's camera to snap a photo and then upload a print Vogue ad). The app brings users to a retail Web site, where they can buy all or some of the pieces in the look. For Vogue devotees, this toy could get even more expensive than their smartphones. It's one thing to ogle fashions in ads, and another to be within a few clicks of buying entire ensembles in a moment of fashion passion. The app can be used to upload items from one's own wardrobe and sort them by designer brand, color or trend, as identified in the current Vogue issue. Users can search trends and find suggestions–populated by computer algorithms–based on the clothes they own and the ones shown in that month's Vogue. The uploading and categorizing might be time consuming, but it is the thing Vogue executives are most excited about. The function is intended to draw in younger readers, whom the magazine isn't necessarily reaching yet. Young people use the Web to upload more than older adults do, Vogue says. "The younger generation that's coming up is all about putting things up," says Susan Plagemann, recently appointed publisher of Vogue. "Uploading is what they want to do, rather than just downloading." There are goodies salted through the application—discounts, exclusive products—which can be "unlocked" by snapping a photo of an ad—just a little extra inducement to buy the magazine. COMMENTARY: Looks like high-fashion is going mobile to target today's upscale and fashion conscience consumers. The Vogue Stylist mobile app just happens to coincide with a similar announcement by Dolce & Gabana's to stream http://xurl.at/u7 their London and Italian Fashion Week fashion shows. Hummer was set to be sold off to Sichuan Tengzhong Heavy Industrial Machinery, but General Motors on Wednesday said that will not be happening. Like its Pontiac and Saturn brands, Hummer is going away. GM, which says Tengzhong was "unable to complete the acquisition of Hummer," will begin winding down the brand. "One year ago, General Motors announced that we were going to divest Hummer, as part of focusing our efforts on Chevrolet, Buick, GMC and Cadillac going forward," said John Smith, GM and VP of corporate planning and alliances, in a release. "We have since considered a number of possibilities for Hummer along the way, and we are disappointed that the deal with Tengzhong could not be completed." The company says it will continue to honor warranties, while providing service support and spare parts to current owners around the world. Ironically, the GM marque gets the highest scores for a mass-market brand in the latest J.D. Power & Associates Consumer Service Index; in fact, GM has six of its brands in the top seven. Three of them, however, will soon be only a memory. Following Hummer in the rankings is soon-to-be-defunct Saturn, followed by Buick and Chevrolet. BMW's Mini brand takes fifth place. General Motors' Pontiac -- also in its final days -- is next, then GM's GMC truck brand. Rounding out the top 10 mass brands are Ford and Hyundai. At the bottom are Nissan, Jeep, Mazda and Suzuki. The best improvers over last year in mass-market vehicles are Kia and Volkswagen. In premium cars, Lexus for the second year comes out on top in customer satisfaction with dealer service, doing particularly well in service quality; service initiation; service advisor; and service facility factors. Lexus is followed, in order, by Cadillac, Jaguar, Acura, and BMW. Cadillac and Mercedes-Benz post the greatest improvements from 2009 among luxury brands, per J.D. Power. The study, which ranks brands by consumer experience at retail, is based on responses from more than 114,200 owners and lessees of 2005 to 2009 model-year vehicles. Fielded between October and December last year, the study is based on dealership experience during a vehicle owner's warranty period, (usually the first three years). Parameters are service quality; service initiation; service advice; service facilities; and vehicle pick-up. The study shows that overall satisfaction with dealer service has increased across the board for the 10th consecutive year. The bad news is that while automakers are seeing higher sales volume this year after slow sales in 2008 and 2009, auto dealers are looking at some slow years ahead if J.D. Power's predictions are accurate. The firm says dealers, who rely on vehicle-service business for revenue, will see big drops in service business following two slack sales years. The firm says 2013 will see the dealer-service market hit a low point caused by 20% worth of service business declines starting in 2009. Jon Osborn, research director at Thousand Oaks, Calif.-based J.D. Power, says dealers have no choice but to focus on luring people to their service bays. "Over time, many vehicle owners gradually defect to non-dealer service facilities for repair and maintenance needs, particularly when the warranty period expires," he said, adding that dealerships must focus on not only providing superior levels of customer service, but on making service more convenient, and competitively priced versus non-dealer business, like Jiffy Lube. COMMENTARY: Although I feel bad about GM having to end the brand, shutdown their Hummer production line and layoff so many workers, the Hummer's MPG of 14 city and 18 highway and high carbon emissions, simply do not justify production of such a gas-guzzling vehicle. Good bye Hummer. Now you are a collector vehicle. You won't see the Griswolds driving this car to Walley World any time soon -- it's a one-seater with no air conditioning or windshield wipers, and it cost $109,000 to build. But the solar-powered vehicle that was designed from scratch and constructed from the ground up by a team of Stanford University students gets 1,400 miles per gallon of gas and is capable of speeds of more than 70 mph. And, by the way, it is highway approved. "About two weeks ago, I was driving on 101 in San Francisco and this thing passed me," said Jennifer Westerbeck, coordinator of Alisal High School's engineering academy. "I thought to myself, 'How cool,' and I actually followed it to a little warehouse" at Stanford. That is where she met the driver, Ben Stabler, and Nathan Hall-Snyder and Alice Che, members of the Stanford Solar Car Project, a program that has produced nine solar vehicles since it was founded in 1989. "We get a lot of strange looks when we're on the highway," said Stabler, a sophomore from London who served as the electrical team leader on the project. "Everybody who sees us gets out their camera phones." The space-age machine they showcased at Alisal -- "The Apogee" -- weighs about 400 pounds and can travel at 75 mph for about two hours, or at 40 mph forever, using the type of solar panels installed in houses. The car can run for two hours on battery power if there is no sun, and can drive across the U.S. on a gallon of gasoline. Stanford students designed and built it in two years, entered it in a world competition last fall in Australia, and drove it almost 1,900 miles without using a drop of fossil fuel. "When you're running at around 40 mph, this car uses about half the electricity that your hair dryer uses. That's how efficient it is," said Hall-Snyder, a sophomore majoring in mechanical engineering. "If the sun's shining, you can run all day on solar power. On a rainy day, it doesn't do as well." Hall-Snyder, who built a car from scratch as a high school student in Park City, Utah, worked on the brakes, the steering and a lot of the design work. Stabler spearheaded the team on electrical issues. What they created is a vast improvement over the vehicle produced by the original team in 1989. That car weighed more than 1,000 pounds, was more than 20 feet long, had solar panels about 12 square meters, and "looked like a big, ugly cockroach," Hall-Snyder said. The newest version is mostly lightweight, carbon-fiber materials that are six times stronger than steel, with paneling similar to the kind used on the space shuttle. It has a more efficient aerodynamic design, all of which enabled the Stanford team to place 10th out of 30 teams and fourth in its class at the race in Australia. "It's actually very noisy," Hall-Snyder said. "The most efficient way to drive the motor is using magnetic fields, which click very loudly when they turn on and off. So you have to wear earplugs." The car has one gear and accelerates from zero to 60 mph in about 11 seconds. "It's unlikely that solar cars that look like this one will ever be on the road, mostly because carbon-fiber materials are so expensive, but there's a car called the Aptera 2E that will be on the market in about two years," Hall-Snyder said. "That one looks more like a solar car than any car that's on the road today, and it'll get about 300 miles to the gallon." But the Stanford project is worthwhile, he believes. "It serves as a test bed for new technologies, and it demonstrates how cool engineering is," he said. "It shows what solar, and green, and electrical-vehicle technology can do when you take it to the cutting edge." COMMENTARY: Stanford's solar-powered car is called Apogee. I am disappointed that the car, a product of such a prestigious educational institution as Stanford, and known for its engineer school, could only muster a 10th place win in Australia. I bet Larry Page and Sergey Brin aren't too happy about that. 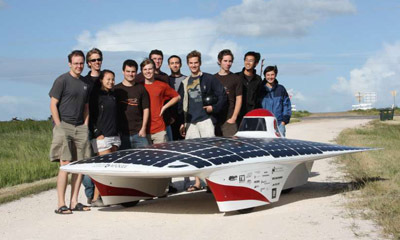 Click here for the official Stanford Solar Car Project website. A story and pictures of the Stanford team preparing the Apogee for the Australian race can be read here. Bloom Energy today formally unveiled its energy server, an industrial solid oxide fuel cell that can convert natural gas or other hydrocarbons into electricity pretty much on demand. And in the process, the company has ignited a debate over which of the alternatives to coal, nuclear and centralized natural gas plants might be best. Can we answer it today? No-one of the pivotal factors will be how Bloom's servers (formerly known as Bloom Boxes) perform over time. Board member Colin Powell said at the unveiling that the company doesn't have twenty years of user data. But we can speculate and compare. And here are some of the key things to keep an eye on. Versatility and Up -Front Cost: A 100-kilowatt Bloom server array costs around $700,000 to $800,000, or $7,500 a kilowatt, after incentives that cover around 50 percent of the costs. The company hopes to have home versions that generate a few kilowatts and cost about $3,000 in ten years, but they don't exist now. Bloom, however, doesn't scale down yet. It sells its 25 kilowatt boxes four units at a time. Home and small businesses need not apply yet. Solar systems span the kilowatt and megawatt range. Ergo, when it comes to financing and flexibility, solar wins for now. Can fuel cells scale down? Yes. Panasonic started selling home fuel cells in Japan last year that generate around 1 kilowatt, not enough to power a complete household, for $30,000 before incentives, or $15,000 if you factored in U.S./California incentives. ClearEdge Power has a 5 kilowatt fuel cell that costs $56,000 and drop to the $30,000 to $25,000 range after incentives. (Side note: Bloom's fuel cell produces mostly electricity and a little heat while heat consists of half or more of the power from the Panasonic and ClearEdge fuel cells. Electricity is more valuable than heat so for Bloom to be equivalent in price or less than these guys would be a victory for Bloom.) We're guessing Bloom is aiming for around $1,000 a kilowatt. Ceres Power in England will come out with a fuel cell made in part with diesel components next year. Energy costs: CEO and Founder K.R. Sridhar said the Bloom server will produce power for 9 to 10 cents per kilowatt hour after incentives. This price includes service, maintenance, gas and all of the other costs associated with running it. Commercial solar installations, when incentives and external costs are added, generate power for around 10 cents a kilowatt hour, according to Shayle Kann at GTM Research. Residential solar generates power for around 19 cents a kilowatt hour and utility scale solar costs around 11 cents a kilowatt hour. Cutting edge wind turbines can generate power for costs five cents a kilowatt hour after incentives, according to the American Wind Energy Association. Kann says on average wind is a little less than solar. Wind, thus, still wins this contest and solar and Bloom are about tied. Bloom server buyers will have to contend with fluctuating gas prices: the box does not work if you don't put gas into it. If methane and biogas rise in price, so will the cost of running the box. Buyers, however, can likely insulate themselves with long-term gas contracts. Cost reductions: This is a big question mark. Solar and wind are somewhat mature technologies. Nonetheless, incremental advancements-better solar racking, cheaper thin films, more efficient turbines-continue to bring down the cost of both solar and wind. Bloom is just starting. Three years ago, the same box that now produces 25 kilowatts of power only produced 5 kilowatts. Scott Sandell, a Bloom board member and a partner at NEA, said the costs for Bloom have gone down 25x in a few years. Bloom, therefore, may have an advantage because costs always drop the fastest in the beginning. On the other hand, Bloom is outnumbered. Thousands of engineers in various segments of the solar industry are working on dropping those costs. Do you believe in individual genius or crowdsourcing? That is the dynamic at play here and this will be one of the more interesting races to watch. Maintenance. Solar wins here. Solar panels require a minimum of maintenance. Dust them occasionally and wipe off the snow and you are done. Bloom servers will be monitored closely by their initial buyers. The servers also contain fans and other mechanical objects. More handholding and repairs seem inevitable. One of the big hurdles that Bloom will have to cross is the reliability of the ceramic/zirconium plates inside the fuel cell. These plates, which convert gas to electricity, must operate in an 800 Celsius environment without becoming distorted or corrupted. User data will be heavily scrutinized. Sources say that the plates have a lifetime of five years: replacement at this pace is contemplated in the 9 to 10 cents a kilowatt hour price. If replacement occurs at a faster rate, it could throw off the costs. Warranty. Solar systems have warranties that last 20 years or more. Bloom currently offers a 10 year warranty. That will raise eyebrows. Testing and certification. Solar and wind both have an advantage here. Underwriters' Laboratory and hundreds of utilities have tested and tinkered with photovoltaic panels and wind turbines for years. Getting a solar field approved mostly revolves around obtaining financing. Bloom will have to go through the proctology exam of utility reliability testing. That could take a few years. On the other hand, if Bloom passes these tests well, sales will zoom. Carbon emissions. Solar and wind win again. It takes about four years to work off the carbon footprint of a solar panel. The Bloom server continually emits carbon dioxide. The Bloom server emits about half of the carbon dioxide that would be generated if you bought power from a power plant, but it's still carbon dioxide. Consumers can reduce their carbon footprint by stoking the box with biogas, but biogas remains an exotic substance. Most of the industrial gas sold and shipped in pipelines in the world comes from wells deep in the ground, not landfills or manure digesters. Bloom's patents discuss converting the waste carbon dioxide into a met hane-like fuel by running the carbon dioxide through the fuel cell and adding water. It's a fascinating, but extremely challenging idea. Effectively, that would be like making energy from Gerolsteiner bubbly mineral water and some power. In today's press conference, Sridhar downplayed the carbon dioxide-to-fuel idea, which makes it sound like the idea might be on the far back burner. Still, Bloom represents a step forward compared to power plants. Availability: This is Bloom's biggest selling point. The box can produce power 24 hours a day in a completely predictably fashion. Solar panels only produce during the day and wind turbines are only active about 30 percent of the time. Worse, wind turbines in many areas generate most of their power at night. Storage: Advantage Bloom again. Fuel cells are by their very nature electricity storage devices. Power doesn't get made until gas gets released into the fuel cell stack. General Electric and others are trying to build sodium or lithium battery packs to store power at wind and solar fields but these are in the experimental stage. Sridhar also mentioned that in about ten years, Bloom will add plumbing and other technology to its servers so that the boxes can convert water into hydrogen for more energy storage. Pulling this off will require electricity from an outside source, preferably from solar panels. Don't be surprised to see them team up with Sun Catalytix, an MIT spin-off with a catalyst for splitting water. Competition: Bloom will have to face an array of competitors: General Electric, Siemens, Philips, Areva, you name it. The relatively small company will have to run fast to stay ahead of industrial giants or else face getting acquired. Solar and wind have already gone through this process. Solar and wind companies again can also license ideas and leverage partnerships. Bloom right now is sort of on its own. Manufacturing footprint: the solar industry continues to work off a glut of excess factory capacity. Bloom needs to build its up. Solar, thus, wins for now, but for painful reasons. Although Bloom has raised around $400 million, it will need to raise more to build up factory capacity. As other companies have found, finding financing still remains tough. COMMENTARY: I was hoping to hear that Bloom Energy would be producing a "Bloom Box" or Energy Server for the home, but it appears that it has to scale down and work through some technical gliches, and it will take ten years before an Energy Server for the home and small businesses is available. Blooms present strategy is to go after large commercial users like those that are beta-testing their Bloom Boxes (Wal-Mart, Staples, eBay, Google, FedEx, etc.). Still $700,000 to $800,000 for a commercial version of the Bloom Box is going to be a hard sell. Beta-tersting is one thing, actually selling them is another, even with a 30% tax credit. At $7,500 per kilowatt, this is 7.5 times higher than the most efficient PV solar panels which have broken the $1.00 per watt or $1,000 per kilowatt barrier. Thin film solar panels are right behind, but their lower cost to produce and flexibility, has unique advantages, but it takes a lot more panels to produce the same results as regular crystaline silicon PV panels. In ten years, solar and wind will be further advanced, and most importantly, the cost per kilowatt may come down to below $500. Now we are talking. With those kind of numbers, Bloom is missing out on the huge residential and small business markets. Nobody is going to wait ten years. In spite of the high cost per kilowatt hour, I am impressed with the the on-demand capability of the Energy Server. But, it remains to be seen what kinds of maintenance and durability issues the solid oxide fuel cells will encounter over the next 5 to 10 years. 800 celsius is a lot of heat. Ceres Power claims that their fuel cell technology is much greener and runs at 650 celsius. Big difference. Also, Ceres Power is going after the residential market, and is supported by the U.K. utility industry, with a standalone electricity microgeration plant that can be installed inside the home to produce both heat and electricity. I am still putting my money on Ceres Power. You also have to wonder what General Electric, Westinghouse, Panasonic, Google and others are up to. GE and Westinghouse have very deep bockets and own the commercial and residential markets, and I am sure they are not going to just stand there are let Bloom Energy or any other fuel cell producer take away their market. To download a copy of Bloom Energy's Energy Server data sheet, click here. Home Depot and Lowe’s, the nation’s largest home improvement retailers, posted better-than-expected earnings this week. They said that they did not have to turn to discounts as much as they did last year, and that some customers splurged on higher-priced goods and services like carpet installations. Of Home Depot’s top 40 markets in the United States, all but two showed year-over-year improvement in the most recent reporting period. Some markets in California and Florida, among the states hit hard by the recession, even had sales growth at stores open at least a year, a barometer of retail health. Frank Blake, the company’s chairman and chief executive, said during a conference call on Tuesday that there was “cause for optimism in 2010,” though he described it as a transitional year, not a year of robust growth. For the three months that ended Jan. 31, Home Depot had a profit of $342 million, or 20 cents a share, in contrast to a loss of $54 million, or 3 cents a share, in the period a year earlier. Sales fell 0.3 percent, to $14.6 billion, which executives attributed to store closings. Sales at stores open at least a year were up 1.2 percent — the first increase in years. Also, Home Depot increased its quarterly dividend for the first time since 2006. On Monday, Lowe’s posted a profit of $205 million for the three months that ended Jan. 29, or 14 cents a share, compared with $162 million, or 11 cents a share, in the period a year earlier. Sales increased 1.8 percent, to $10.2 billion. Same-store sales declined 1.6 percent, but that was still the best performance in more than three years. Yet while consumers appear to be taking on more discretionary home improvement projects, retailers are still under pressure. Indeed, Home Depot’s professional business — merchandise typically bought by builders and contractors — was weak, though the rate of decline was not as bad as in previous months. The company’s worst-performing categories included lumber, hardware, electrical goods and other high-priced construction-related categories. Lowe’s, too, said sales to its commercial business customers were soft. Both Home Depot and Lowe’s said that the average amount spent at their cash registers declined from figures in the period a year earlier, though that was not exactly bad news. Sales in Home Depot’s most recent reporting period were driven by the kitchen and bath, paint, flooring and plumbing categories as well as its international businesses. Sales in maintenance and do-it-yourself repair categories continued to be strong. So were simple décor-related categories like ceramic tile, carpet, paint, faucets and bath fixtures. Transactions of $900 or more, which represent about 20 percent of Home Depot’s sales in the United States, declined less than 1 percent. As Craig Menear, Home Depot’s executive vice president for merchandising, put it: that is “a significant improvement compared to double-digit declines in previous quarters in 2009.” He attributed the improvement to consumers snapping up values in Home Depot’s appliances, water heaters and windows categories. Lowe’s said sales of flooring, cabinets and countertops were strong, a sign that consumers were willing to take on more costly projects. Both companies said their results were also helped by cost cuts. 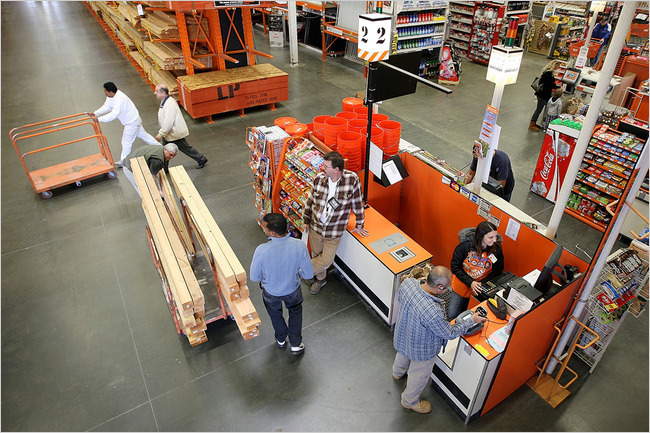 Both Home Depot and Lowe’s predicted business would pick up toward the end of the year. For 2010, Home Depot expects earnings of $1.79 a share, and a same-store sales increase of 2.5 percent. Lowe’s said that for the year it expects earnings of $1.30 to $1.42 a share, and a same-store increase of 1 to 3 percent. Shares of Home Depot rose 43 cents on Tuesday, to $30.75; Lowe’s fell 26 cents, to $22.81. COMMENTARY: The potential for a second real estate bubble still exists as foreclosures continue to increase, not just from sub-prime borrowers, but from prime borrowers. The "Shadow Inventory" and housing overhang of 7 million unsold homes (foreclosures, defaults, regular unsold and REO's) is one of the reasons. The current uptick in real estate prices and sales is only temporary, most of it caused by the $8,000 tax credit for first-time home buyers. Homeowners and first-time buyers took advantage of the flood of foreclosed properties. Nearly half of the closings were foreclosures. The new owners began to make repairs and other improvements, and this helped boost DIY home improvement sales. Another factor are loan modifications and extensions before filing notices of default over the Christmas holidays that slowed down foreclosures in the 4th quarter. If history is any indicator, approximately 40% of those will eventually go into default and be foreclosed on, providing an added boost to the Shadow Inventory. Another reason for the uptick in the DIY home improvement revenues has been the poor weather, with many homeowners purchasing shovels, snow removers and other DIY home items. The arrival of spring also produces an improvement in the DIY home improvement sector as homeowners make minor repairs and improvements to their homes in preparation to show them for possible sale. A Barnes and Noble store in a file photo. NEW YORK (Reuters) - Top U.S. bookseller Barnes & Noble Inc said sales at its stores dropped sharply during the holiday quarter and forecast continued weak sales, sending its shares down 6 percent. The company, a target of billionaire investor Ron Burkle who says it lacks proper governance, said it was betting on a consumer shift to buying digital books for future growth, a market now dominated by Amazon.com. It was the bookseller's first full reporting quarter to reflect the launch in October of its Nook e-reader and its acquisition last year of Barnes & Noble College Booksellers. Comparable sales at its namesake stores fell 5.5 percent during the quarter and 1.3 percent at its College Bookstore stores. But online sales surged 32 percent to $210 million, spurred by the Nook, the company said. "We expect that 2010 will be a watershed year in Barnes and Noble's transformation from being a brick and mortar retailer to becoming a major e-commerce retailer," Chief Executive Stephen Riggio said in a conference call, adding that the Nook was the bookseller's single best-selling item. The company declined to say how much of that online rise came from the Nook compared with physical books bought on its website, but Riggio said the company could win as much market share in e-books "literally overnight." But the push into e-books could harm long-term in-store sales, which still make up the lion's share of business. "The Nook results are encouraging -- the company had to do this -- but e-books will cannibalize sales from existing stores," said Michael Souers, analyst at S&P Equity Research. Barnes & Noble shares fell $1.29 to $20.22 in afternoon trading on the New York Stock Exchange. After several production delays during the fall and into the holiday season, the Nook only became available for in-store orders earlier this month. "We're not making money on hardware," Chief Financial Officer Joseph Lombardi told Reuters in an interview. "But we want to offer the devices to get accounts and be able to sell them the digital products for years to come." Barnes & Noble reported a third quarter profit of $80.4 million, or $1.38 per share compared with a profit of $85 million, or $1.42 per share, a year earlier. Revenue totaled $2.17 billion in the quarter ended January 30, 2010, with College Bookstore contributing about one-quarter of that figure. The lower-margin college stores shaved 2.7 percentage points off the company's margins. Analysts had forecast profit of $1.34 per share on revenue of $2.16 billion, according to Thomson Reuters I/B/E/S. The New York-based company said it expects same-store sales at its Barnes & Noble bookstores to fall between 2 percent and 4 percent in the fourth quarter. The company forecast a fourth-quarter loss of 85 cents to $1.15 a share. Analysts were expecting a loss of 61 cents. Riggio said Barnes & Noble was winning market share from competitors that are closing stores. Borders Group Inc saw comparable sales fall 14.6 percent over the holidays and is closing 183 of its Waldenbooks stores. Barnes & Noble's College Bookstore, which it bought last summer for $514 million from co-founder, Chairman and largest shareholder Leonard Riggio, is expected to see same-store sales range from a 1 percent drop to a 1 percent rise in the current quarter. "The textbook business is a competitive business --students have options," Lombardi said, adding that growth would have to come from winning more accounts. Burkle's Yucaipa Cos LLC has sought to nearly double its 18.7 percent stake in Barnes & Noble, a move that would make it the company's largest shareholder. But Burkle has been blocked by Leonard Riggio and the board, who put in place a poison pill anti-takeover provision in November. Barnes & Noble, which operates 719 namesake stores, opened three stores and closed nine during the quarter. COMMENTARY: I don't go to Barnes & Noble as much as I used too because they don't have and chairs in the book store. You have to go to the in-store Starbucks and fight for a place to sit. They really need to get that shored up. Scribd has emerged over the last year as a popular way to share documents from recipes to PowerPoint presentations online, boasting tens of millions of readers each month. Now the San Francisco-based startup is extending its content distribution platform to mobile devices encompassing smartphones, e-book readers and the forthcoming iPad. A new feature launching Wednesday will allow Scribd users to send material from the Web to their own devices -- whether an iPhone or Android phone or e-readers including the Kindle, Barnes & Noble's nook and Sony Reader, among others. Separately, the company is releasing a series of application protocol interfaces (APIs) enabling device makers to integrate Scribd features like search and social networking more tightly into their gadgets. That effort might even include adding a "Scribd" button to a phone interface. And starting next month, Scribd will roll out applications for the iPhone and Android phones that promise to offer "a richer search, browsing and social experience directly" from these devices. It also plans to make PDF documents available in the open ePub publishing format for books, magazines and other content. "Today's launch of our send-to-device feature and mobile API represents a major step forward in our strategy to provide open access to Scribd content," said the company's co-founder and CEO Trip Adler, in a statement. "We look forward to giving consumers even more mobile reading options in the coming weeks and months." Tammy H. Nam, vice president of content and marketing at Scribd, said in an interview that the new mobile initiatives would help turn smartphones into e-readers while also boosting the e-reader market by providing access to content that might not be available otherwise. That includes everything from vampire fan fiction to origami instructions to academic journals. Overall, Scribd says it offers a catalog of 10 million documents in 90 languages, most of which are free. Publishers selling books through the Scribd Store include Simon & Schuster, O'Reilly Media, Chronicle Books and John Wiley and Sons, publisher of the popular Dummies series. Nam said Scrib will introduce additional options for publishers and other content producers to monetize works distributed through the company's site, including e-commerce and advertising-based business models in the second quarter. To date, Scribd has raised nearly $13 million in venturing funding through investors including Charles River Ventures, the Kinsey Hills Group and Y Combinator. Scribd is breaking down barriers to the publishing process, making written works available to people on the Web and mobile devices, and most importantly, fueling the conversations happening around them. Documents published on Scribd are accessible to Scribd's community of readers, indexed by search engines, and easily embedded and shared on thousands of other Websites, including Twitter and Facebook. Many leading media companies and businesses distribute content through Scribd, including The New York Times, Ford Motor Company, Simon & Schuster, O'Reilly, World Bank, Chicago Tribune, Carnegie Endowment for International Peace and more. The start-up received conditional approval today for their Ivanpah project, which would be the first new solar thermal plant built in California in almost 20 years.� The project is notable as one of the world's largest solar projects at hundreds of megawatts of power -- capable of electrifying more than 100,000 homes while providing hundreds of jobs and hundreds of millions in tax revenues over its 30-year lifetime. The power generated from these solar plants will be sold under contracts with Pacific Gas and Electric (PG&E) and Southern California Edison (SCE).� PG&E will purchase about two-thirds of the power generated at Ivanpah and SCE will purchase approximately one-third. BrightSource’s contracts with PG&E and SCE total 2.6 gigawatts. Technology development is important in renewable energy.� Solar has to work and work at the right price.� But political will and financing tools have to be in place to make big solar work, and today's announcent is a positive step in that direction. Who knew that Hewlett-Packard was into fuel cells? Back in the earlier part of the decade, HP filed and obtained a number of patents for fuel cells, particularly proton exchange membrane fuel cells powered by hydrogen. Toshiba and other consumer electronics companies were doing the same then too. The company, however, never pursued commercialization. But rather than just sitting on the intellectual property, it has decided to sell these patents off. The three patent lots -- which collectively contain 86 patents -- are being sold by WavePoint, and the minimum purchase price is $500,000 per lot. Although the patents revolve around hydrogen fuel cells, the patents also relate to solid oxide fuel cells, according to Paul Cannata, director of business development at WavePoint. Bloom Energy, which came out of stealth last night on 60 Minutes, makes solid oxide fuel cells. HP's patents also potentially pertain to the design of portable fuel cells, a technology the military has examined for years as a way to provide troops in the field easier access to electricity. Fuel cells can also be viewed as energy storage devices. If there is a tank of the appropriate hydrocarbon handy, you can make electricity on demand. The first lot consists of 27 patents and revolves around hydrogen generation, fuel flow control and increasing fuel cell efficiency. Patent 6790416, for instance, discusses a way to generate hydrogen from water with sodium borohydride and electricity. It is similar to the low-energy approach contemplated by SignaChem and Alumifuel. Patent lot number 2 consists of 17 patents revolving around fuel cell cartridges (think of print cartridges cross-bred with batteries), and the final lot of 42 patents revolves around the design of a fuel cell stack. This last lot could potentially be the most interesting because it deals with material science, which could be exploited in other products or types of fuel cells. U.S. patent number 6620542, for example, describes a porous metal that effectively eliminates the need for microchannels or micro-plumbing to allow oxygen and/or fuel to move around inside a fuel cell. At the beginning of the decade, start-ups and large outfits like IBM and Microsoft began to try to extract more value from their intellectual property portfolios through auctions and/or licensing. Some feared that it would lead to an explosion of litigation with so-called patent trolls wielding patents as a way to extract legal settlements from innocent bystanders. In fact, some of the more innovative ideas in green tech have come out of the intellectual property industry. TerraPower, a startup that wants to make modular nuclear reactors that don't need to be refueled for 30 years, emerged out of Intellectual Ventures, an intellectual property firm co-founded by ex-Microsoft chief scientist Nathan Myhrvold. IBM, meanwhile, has found that a material it originally created for immersion lithography could be used to reduce the cost and energy required to desalinate seawater. HP, meanwhile, has devised some novel transistor patents that it has tried to license. Interested parties should contact WavePoint before the end of the month. COMMENTARY: OKAY, I'm on it. Fuel cells are the hotest thing right now. Incredible how many companies are into fuel cells. Can hardly wait for that Bloom Energy public announcement today. Save me some of those patents. But wait, I don't have $500,000.